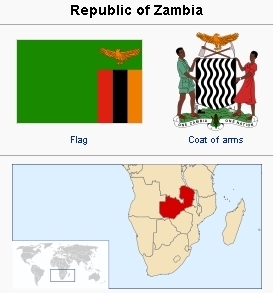 The Republic of Zambia is located in Southern Africa. The neighboring countries are the Democratic Republic of the Congo to the north, Tanzania to the north-east, Malawi to the east, Mozambique, Zimbabwe, Botswana and Namibia to the south, and Angola to the west. The capital city is Lusaka. 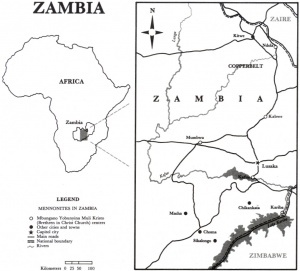 The total area of Zambia is 752,618 km2 (290,587 sq mi) and the 2009 estimated population was 12,935,000. Zambia has been inhabited for thousands of years by Khoisan hunter-gatherers. Gradually, other ethnic groups also settled in the area, leading to a multi-ethnic country. After visits by European explorers starting in the 18th century, Zambia became the British Colony of Northern Rhodesia in 1911. In 1953 the Federation of Rhodesia and Nyasaland was created, which also included what is now Zimbabwe and Malawi. On 24 October 1964, the country declared independence from the United Kingdom and prime minister Kenneth Kaunda became the first head of state. Almost 90% of Zambians belong to the nine main ethnolinguistic groups: the Nyanja-Chewa, Bemba, Tonga, Tumbuka, Lunda, Luvale, Kaonde, Nkoya and Lozi. Approximately 85% of the population are Christians. Traditional religious thoughts blend easily with Christian beliefs in many of the country's syncretic churches. Approximately 5% of the population are Muslims with most living in urban areas. Mennonite work beyond that of the Mbungano Yabunyina Muli Kristo (Brethren in Christ Church) began in Northern Rhodesia in 1962. In the middle of that year two Mennonite Central Committee (MCC) Teachers Abroad Program (TAP) workers were assigned, under the direction of the bishop of the Brethren in Christ Church in Africa. Both teachers were placed near the capital city of Lusaka at Chipembi Secondary School, one of seven secondary schools operating in northern Rhodesia at that time. In October 1964 Zambia received its independence from Great Britain, and the ensuing emphasis on national development included a strong push for more education. A favorable economic situation due in large part to high prices for copper, Zambia's chief export, made possible rapid expansion to 98 secondary schools by 1970. In response the number of personnel increased to 14 by 1966 and to 30 by 1970. These workers continued to work in church-related (including one BIC) secondary schools in central Zambia. The MCC program expanded in 1967 with the placement of two Pax volunteers. In the following years Pax personnel were assigned as maintenance workers at the Brethren in Christ hospital at Macha and at two other church-related farm training institutes. In 1970 two teachers were placed at David Livingstone Teacher Training College, an institution of the Christian Council of Zambia (CCZ). After nine years of administration by Brethren in Christ field staff, MCC appointed its first full-time director for the Zambia program in 1971. While numbers of teachers remained high, assignments in locations such as the University of Zambia and the African Literature Centre (an inter-church adult education program) increased the diversity of the program. Teachers were also spread out in remote schools from one end of Zambia to the other. With close to 80 percent of teachers in Zambia still expatriates in the early 1970s, it was clear that the training of Zambian teachers was not being accomplished as quickly as hoped. Nevertheless MCC administration began to discuss ways to become involved more broadly than in formal education. While no single program direction replaced the education thrust, workers were seconded to a post-secondary agricultural institution, the YWCA, a Zambian organization promoting women's groups in urban squatter areas, and the government district nutrition office. By the end of the decade Zambia could provide most of its own teaching staff; along with that came a growing call to hire Zambians in positions formerly held by expatriates. MCC workers during this time became aware of the needs of school leavers, those who for lack of means or space were excluded from the education ladder. Source: Mennonite Encyclopedia, v. 5, p. 957. During the 1970s Zambia became home to thousands of refugees fleeing the war being fought with increasing ferocity against the white minority government of its neighbor (Southern) Rhodesia (later Zimbabwe). The conflict with colonial powers in Angola and Mozambique also affected Zambia, since all but one of its transport links to the ocean passed through these three neighboring countries. In 1979, after contacting representatives of one of the Zimbabwean liberation movements in Lusaka, MCC began providing material aid to refugees in Zambia through an arm of the CCZ. Rhodesian raids on refugee and other targets in Zambia kept the level of tension high until an agreement to end the war was signed and independence came to Zimbabwe in 1980. Relationships between MCC and the Brethren in Christ church took on a renewed importance in the 1980s. From 1981 to 1983 a missionary couple sent to Zambia by the United Church of Christ (US) mission board were placed through MCC in a Brethren in Christ rural development and nutrition program. Later, in 1986, conversations were renewed on ways of working jointly in those areas. In 1981 the first two Zambian young people selected by the Brethren in Christ church went to North America through the MCC Visitor Exchange program, and several others have participated each year since then (international exchanges). In 1983 the church, assisted by MCC, organized a visit by Messiah College professor Martin Schrag to spend time teaching on biblical peacemaking and reconciliation. While the end of the war in Zimbabwe had eased some tension, Zambia's role as a "frontline state" in relation to South Africa was a critical issue for many church people, who shared with all Africans a strong desire for an end to white minority rule in South Africa. In the 1980s MCC also began working with the African Methodist Episcopal Church in education, community agriculture, women's work, and technical training. Research into the region's agricultural potential led to involvement in a government soya bean research and extension project in one district, and to the appointment in 1986 of full-time coordinators for the MCC agricultural program in both Zambia and Zimbabwe. At the turn of the 21st century, MCC continued to work with community development, education, and peace-building in partnership with the Brethren in Christ Church, and increasingly began to focus on addressing HIV/AIDS and poverty. Zambia had a reported national HIV prevalence rate among adults aged 15-49 of 15.2% in 2008, with approximately 1.1 million children and adults aged 0-49 living with HIV at the end of 2007. MCC supported initiatives such as training pastors and church members in counseling and home-based care for those affected by HIV/AIDS and distributing AIDS care kits. 2008 Country Profile: Zambia. The United States President's Emergency Plan for AIDS Relief. Web. 12 October 2008. http://www.pepfar.gov/pepfar/press/81694.htm. MCC Africa administrator trip reports, 1963-1986, in MCC files, Akron, PA.
MCC in Zambia. Mennonite Central Committee. Web. 12 October 2008. http://mcc.org/zambia/. Kraybill, Paul N., ed. Mennonite World Handbook: A Survey of Mennonite and Brethren in Christ Churches, 1978. Lombard, IL: Mennonite World Conference, 1978: 117-120. Mennonite World Conference. "2000 Africa Mennonite & Brethren in Christ Churches." Web. 2 March 2011. http://www.mwc- cmm.org/Directory/2000africa.html. [Broken Link]. Mennonite World Conference. "Mennonite and Brethren in Christ Churches Worldwide, 2006: Africa." Web. 2 March 2011. cmm.org/Directory/2006africa.pdf http://www.mwc-cmm.org/Directory/2006africa.pdf. [Broken Link]. Mennonite World Handbook Supplement. Strasbourg, France, and Lombard, IL: Mennonite World Conference, 1984: 22. Heisey, Nancy R. and Richard D. Thiessen. "Zambia." Global Anabaptist Mennonite Encyclopedia Online. April 2011. Web. 23 Apr 2019. http://gameo.org/index.php?title=Zambia&oldid=115245. Heisey, Nancy R. and Richard D. Thiessen. (April 2011). Zambia. Global Anabaptist Mennonite Encyclopedia Online. Retrieved 23 April 2019, from http://gameo.org/index.php?title=Zambia&oldid=115245. Adapted by permission of Herald Press, Harrisonburg, Virginia, from Mennonite Encyclopedia, Vol. 5, pp. 957-958. All rights reserved. This page was last modified on 8 March 2014, at 18:49.